Latex mattresses provide outstanding support and comfort but might just be the most misunderstood bedding option available on the market today. Largely because it can be created in so many different ways resulting in a multitude different qualities and comfort feels. These differences result in a wide price differential that leaves many would-be customers confused over their options. Our research has found that some manufacturers are reluctant to disclose exactly how their product is made. While we respect the confidentiality of proprietary information, it does make it more difficult to assess and compare the real value of these mattresses without those specifications. As a general rule, we’ve discovered better quality latex mattress manufacturers are quick to share information about their product while lower priced, lesser quality companies tend to be elusive in their responses. They simply state that their mattresses contain latex and offer little or no additional information. In fairness, this does not mean all lower price point latex beds are not a good value for the dollar. We simply recommend putting the price in proper perspective with your overall expectation level. We’ll try to shed some light on what the actual differences are as they pertain to quality, support, comfort and overall value. What is Latex and how is it made? Latex is created when a liquid foam is transformed into a solid through a vulcanization process. There are different methods of processing the final product which can be 100% natural, 100 synthetic, or blend of both. We’ll take a look at the various benefits and possible concerns of each available option. Natural latex is produced with raw latex polymer (rubber tree sap). that is grown in the regions closest to the equator. 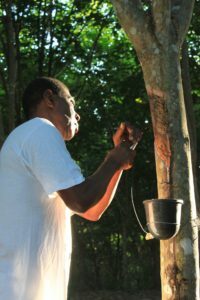 The sap is extracted in a manner similar to that of maple trees in the production of syrup. in order to be considered natural, the product must be 95% rubber with no synthetic materials such a petroleum, sand or ash. It is then shipped around the world and processed in either the Dunlop or Talaly process. Both processes begin by mixing large amounts of tree sap in a centrifuge then pouring the mixture into a mold where it is vacuum treated. At this point Dunlop and Talaly take slightly different turns. To be considered organic, natural latex must be certified by the Global Organic Latex Standard (GOLS). This organization is also underwritten by the USDA. Organic, like natural, must certified to be a minimum of 95% organic raw material; as specified in GOTS (Global Organic Textile Standard). The GOLS certification maintains that every effort has been made to separate organic from non-organic products and also places great importance on environmental sustainability. The certification notwithstanding, Natural and organic latex have the identical support, comfort and durability. Although it is a prestigious honor, from a purely performance standpoint, there are no discernible differences. Synthetic latex is a petroleum based foam that simulates the properties of natural latex. It tends to feel less bouncy and buoyant than natural. By comparison, it is also less durable and unpleasant odors have periodically been reported with new mattresses. Some manufacturers will occasionally blend natural and synthetic latex. Depending on the actual amount of natural latex in the mixture, quality can vary greatly. Because the actual percentage is rarely disclosed, it’s difficult to predict, durability and overall performance. Some manufacturers use small percentages of natural just to be able to make the claim that it is there. Again, your best bet here is to purchase from manufacturers who are transparent when it comes to their product specifications. The Dunlop process mixes sap from the rubber tree in a centrifuge; then vacuum seals and bakes the mixture while allowing natural sediments to settle. This results in a the bottom layer of the mold having a firmer consistency. The layered molded strips can be flipped over and combined to create various levels of firmness. The Dunlop process creates a dense foam that is both supportive and comfortable. The Talaly process begins the same way as Dunlop but after the sap is mixed, it is flash frozen to stabilize cell structure and insure better consistency of the off the foam. Then it is baked to complete the vulcanization process.This process produces a softer, more consistent texture and feel. Dunlop VS Talaly: Which is better? Because of its denser consistency, Dunlop latex is the slightly firmer of the two while Talaly possesses a bit plusher over all feel. Both posses a supportive and a buoyant quality that create a feeling of floating on top of the mattress, opposed to sinking into the bed. Because of the additional processing involved, Talaly is a more expensive process. Although the general consensus is that the end result is a slightly more consistent product, Dunlop is deemed by the vast majority of manufacturers to be a more cost effective way to produce natural latex. Either Dunlop or Talaly latex mattresses are wonderful options for support and comfort. From a simply economic standpoint, Dunlop remains a more price conscious option due to lower manufacturing costs. Latex mattresses offer outstanding pressure relief while maintaining proper support and alignment. These beds are resilient and have a buoyant quality that creates a sensation of floating on top of the mattress. Latex is known to reduce shoulder and hip pain while maintaining proper support and alignment. Pain reduction and prevention has been reported by one third of consumers surveyed. Like Memory Foam, Latex mattresses rank among the highest with an 80% customer satisfaction rating. Owners of Latex mattresses occasionally report heat retention issues although not as prevalent as Memory Foam. The greater the percentage of natural latex in the formula, the less this tends to be an issue. However, these beds can cost considerably more. Often times, Latex beds require a bit of a break in period in which the mattress will soften up over a brief period of usage. So be prepared for a possible transition period before your mattress feels its best. Because of of the density of the foam, Latex is also quite heavy compared to other foams. Latex mattresses remain among the highest rated beds with very few downsides. When considering a purchase, take time to research the different manufacturer’s offerings. Remember, the greater the percentage of natural Latex, the more supportive, pressure relieving and durable your mattress will be.